PolicyGenius CEO Jennifer Fitzgerald pitches her business to FBN’s Deirdre Bolton during an elevator ride. Looking for the right insurance plan can be complicated, but startup PolicyGenius is looking to make it easier to find the best coverage with its online portal for quotes and plan comparisons. 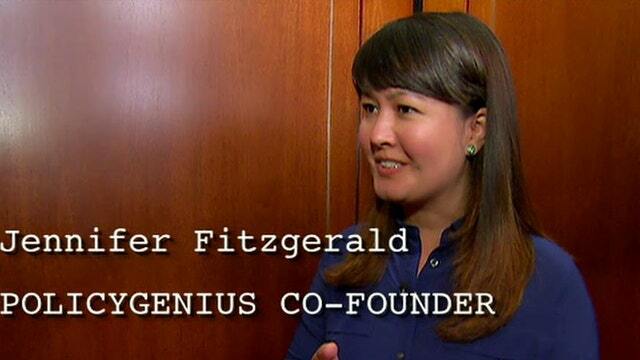 PolicyGenius co-founder and CEO Jennifer Fitzgerald will be appearing on FOX Business&apos;s Risk & Reward on Friday, Sept. 5, to make the case for her startup to host Deirdre Bolton and judges About.com founder Scott Kurnit, Newscred director of business operations Amy Wu, and David Aronoff from Flybridge Capital Partners. PolicyGenius aims to simplify insurance selection with its online guide for life, pet, rental and long-term disability plans. “We started in areas where Americans are underinsured and that no other tech company is focused on,” Fitzgerald says. Formerly a consultant at McKinsey & Company, Fitzgerald says she developed PolicyGenius with the intent of appealing to younger online-oriented consumers. PolicyGenius has raised a $750,000 seed round from angel investors, but is hoping to raise additional capital this fall to further fund their growth.